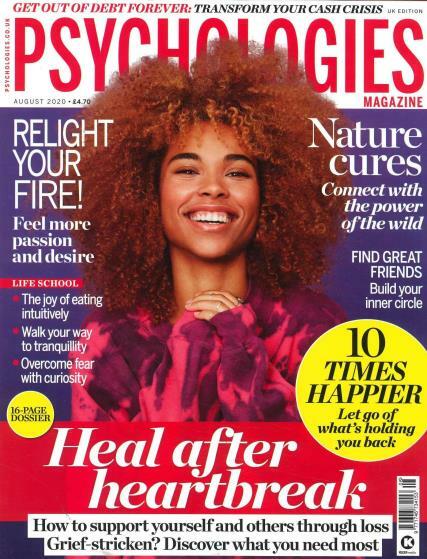 Psychologies Magazine helps us to interpret the most fascinating, up to date psychology processes and apply them to our personal lives and emotions. The magazine covers a variety of topics from families, love and relationships and the self to beauty and the body, travel, food and culture. It also features Monthly related articles, forthcoming events around the UK, reader’s problems, reviews, news and a whole lot more.So join the thousands of women improving themselves and their lives by reading the magazine and order your subscription today! I enjoy all the articles it contains. Have always loved this magazine as it is so different, interesting and intelligent. "I think Psychologies fills a bit of a gap in the market. It is a more mainstream magazine than I would have thought. A great read with lovely articles, which were very interesting. Each page was as good a read as the next magazine. It has a surprising range of in-depth content. However, it is for a more mature woman. Psychologies is always an interesting read and the perfect mix between a lifestyle and serious magazine. I used to love this magazine but I disagree with their inclusion of beauty articles - not exactly in keeping with improving mental wellbeing. Love this magazine. Such a change from reading about celebrities and such a diverse range of topics covered. I find the magazine extremely informative and interesting. interesting and knowledgeably although the magazine was a gift. Magazine is for my daughter-in-law in Canada - hence no comments from me!